When Candice Kerkermeier hears from teachers that their students are acting out or struggling in school, she reminds them that there might be more than meets the eye – and it might have something to do with past traumas. Research shows that trauma can have a significant impact on brain development, physical and mental health, sexual behaviour, health care costs and life expectancy. Candice is the Mental Health Leader for Keewatin Patricia District School Board (KPDSB) in Kenora. She works with school administrators to implement the Board’s mental health strategy in 21 schools. She notes that all staff from all departments can benefit from understanding the link between trauma and behaviour; in other words, being more trauma-informed. A trauma-informed approach is considerate of youth who are struggling with mental health issues and/or addictions since it creates a safe environment where people feel supported. Using a non-judgmental approach, it’s a shift from “what is wrong with you” to, “tell me what happened to you/how can I support you”, explains Kerkermeier. This approach has been especially important in the justice sector, which was a focus for the Kenora-Rainy River Youth Justice Service Collaborative for the past four years. With support from CAMH’s Provincial System Support Program (PSSP), the Collaborative worked to implement a screening tool across all service providers, developed a map of the services to help people navigate the intersection between justice and mental health and addiction systems, and created a protocol to help agencies work towards trauma-informed approaches. That protocol, along with coaching and implementation support from the PSSP team, was a perfect fit for Candice and the school board. 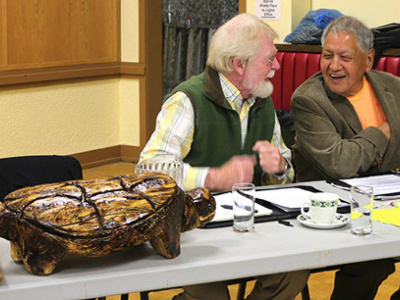 (L) Rupert Ross, retired Assistant Crown Attorney for the Kenora District; (R) Colin Wasacase, City of Kenora council member at the Healing Trauma Through a First Nations Lens workshop in June 2015. Rupert was one of three presenters and Colin was the Master of Ceremonies. For Kerkermeier, the effort to train all school board staff was well worth it, made easier by the fact that the majority of the staff was requesting more knowledge in this area. She recently received the results of a survey looking at how the new changes have been going; 550 staff responded, a great response rate she attributes to staff’s commitment to this issue. The school board plans to continue with in-person training, developing webinars, and professional development on trauma with a lens to making it culturally appropriate for First Nation, Inuit and Métis peoples. The shift towards trauma-informed care will take time, and while key sectors of the community have begun to make those changes, the goal is for everyone to become trauma-informed.